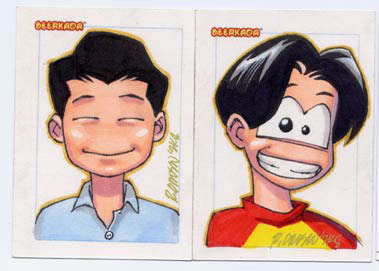 Beerkada Comics » Sketchcard update: how to get one. Sketchcard update: how to get one. Here are Ryan O.’s completed sketchcards. The third image shows the back of every sketchcard. There will be a total of 100 sketchcards for the first edition. To get a sketchcard, get your Beerkada book 8 signed by Lyndon and he will give you a one-of-a-kind sketchcard. I’m holding out for the CCGs. The one I plan to make with various local comic artists. So I could pit Polgas with Pupung and let him be ripped to shreds for all those years of horrible nyek jokes. Stop getting into my head Lyndon! THE IDEA IS MINE! NNNNNGGGGGHHH! so sorry for the delay reaction.. when will the Book8 be out? Did I mention I was prone to mania? Just tell me where and when and I’ll start setting up camp outside the book signing ASAP. Those cards will be mine!